So, I’m a little ashamed to admit that this was my first real experience of Chinese food in Toronto (my previous Chinese experiences are a little hard to use as a comparison). No rating for food, then. I’m sort of glad I heard about the scandal surrounding Dumpling House after I ate. I mean, I’m not expecting wonders of cleanliness for any restaurant of this calibre. This is not fine dining, people. And I kind of expect the heavy reliance on deep frying to burn off most bacteria, or whatever. But I can’t say I’m too thrilled when I hear that this place was shut down a while ago for failing to meet health code standards (someone snapped a picture of rats near the food). That being said, I’m sure things are okay? As my dining companion suggested: a health code violation probably means it’s BETTER, not worse than before. 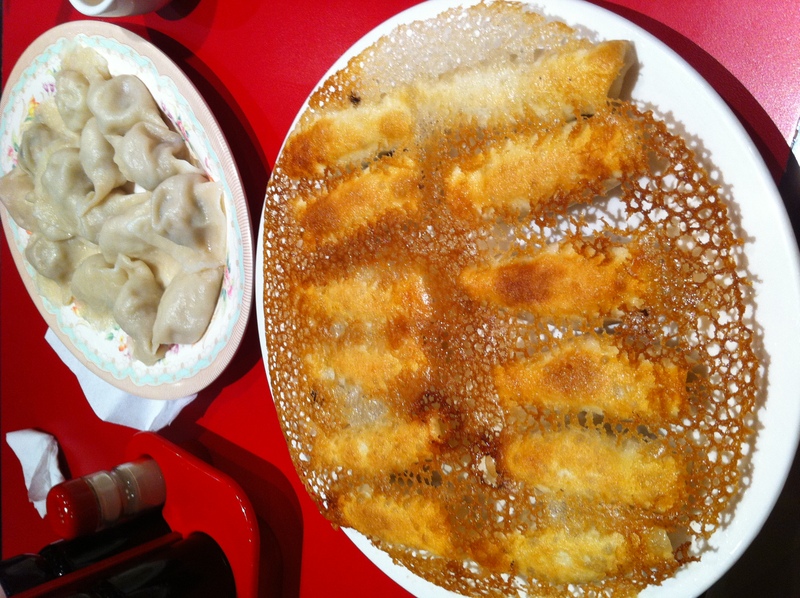 In any case, dining at Dumpling House was quite the experience. The dumplings were definitely a winner. They’re made fresh in-house and cooked to order- you can watch the ladies at the front of the restaurant rolling the dough and packing in ground meat and veggies. The boiled dumplings were tasty, but it was the fried ones that really caught my eyes. $7 dollars is all you pay for 12 rolls of crispy delicious goodness. You can order all one kind, or for the same price you can choose 3 different kinds. I can’t say I could really tell the difference between the pork, the beef, even the shrimp (the veggie had a bit of a different flavour), but all were delicious. And the amazing crispy shell that held the dumplings together in lacy golden brown goodness made me drool a little with anticipation. The soup was good too. We got a bowl of Hot and Sour, which was an absurd bargain at $3 for a bowl that was probably enough to serve 4 people, especially as a side. We also ordered the Potato Threads, which was a massive plate of seasoned thin strips of raw potato, dressed like a salad with an oily-tangy dressing and cilantro, etc. A unique accompaniment, although I wouldn’t be in a rush to get it again. The service was unexpectedly friendly and efficient, providing us tea, refilling our water, bringing us our sauces, and generally checking in regularly. Some classier restaurants I’ve been to could have taken tips from these guys! Overall, a pretty interesting experience! This entry was posted in Chinese, Dine Under $50 and tagged dumplings. Bookmark the permalink.